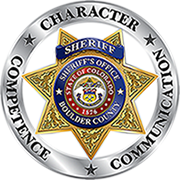 At Boulder County Sheriff’s Office Restorative Justice (BCSO RJ) we use a circle process for our conferences. In many cultures, sitting in a circle is both functional and symbolic. Everyone can clearly see everyone else, and each person is valued and has an important role to play (there is no “head of the table”). What takes place in the circle remains confidential so that participants can have an honest exchange about the harm. All volunteers sign a confidentiality agreement and each person who participates in a circle (as offender, victim, community member or support) is charged with confidentiality, too. Here’s a basic outline of the process. Referral: BCSO RJ receives referrals from a deputy, detective or other law enforcement agency, for cases in which an offender faces criminal charges and/or has caused harm. Deputies/detectives present the restorative justice option to those affected by the crime. Initial contact: BCSO RJ Coordinator contacts affected parties to schedule the restorative justice conference, then assigns the case to two BCSO RJ facilitators. Preliminary meeting: BCSO RJ facilitators contact affected parties to set up a preliminary meeting which is held prior to the restorative justice conference. Facilitators meet face to face with the victim and offender, and talk on the phone to other affected parties to learn about the incident and resulting needs, and to prepare everyone for the conference. Conference: BCSO RJ facilitators bring together all the affected parties, community volunteers and law enforcement. The offender tells what happened, the victim speaks about the impact of the crime, and the group works collaboratively towards a contract. Contract: The offender has a specified amount of time to complete the contract agreed upon at the conference. Once the contract is completed and the BCSO RJ Coordinator has received all contract items, the offender has fulfilled his or her obligations for that incident and no further actions are required. If the contract is not completed, the case is referred back to the deputy/detective for charges.